Jayadvaita is Wrong — still he insists on justifying his blunders? A complete comparison of the 1975 original edition of Srila Prabhupada’s Sri Caitanya-caritamrta with the new ISKCON/BBT revised edition highlighting all the changes. All Glories To Srila Prabhupada, the 1968 and 72 Editions of TLC are the same. After that (1974) many changes took place. Srila Prabhupada didn’t really like those changes and wanted that the original TLC be printed again. That didn’t happen and now we have over 1,108 changes in the TLC. In other words the whole TLC was re-written. Just What is Jayadvaita’s Point? Leave Srila Prabhuapda’s Books Alone! 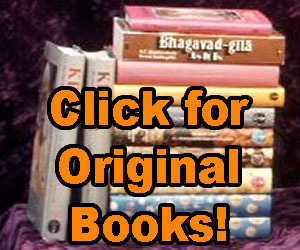 Who Authorized ISKCON’s Bhagavad Gita Changes?